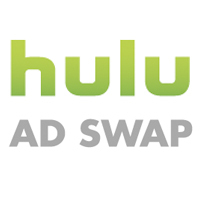 Hulu on Tuesday announced a new “Ad Swap” program that allows users to swap out ads they are watching for a new ad if the current offering isn’t something they are interested in. The announcement comes after recent studies have found Hulu video ads to be twice as effective as television ads. “When an ad begins to play, a user can click on the Hulu Ad Swap icon in the top left corner of the player and bring up a number of ad choices, customized to that user’s profile and previous ad viewing preferences. At this point, the user can select a more relevant ad from the available choices. Hulu Swap Ads have been tested in limited release over the last several months and the company says they have a “significant impact” on the effectiveness of ads. Hulu officials say brand recall improved by 93 percent, brand favorability was up by 27 percent and purchase intent increased by 35 percent. Hulu Swap ads are also said to have a relevancy of 46 percent. While I will never “look forward” to commercials outside of the Super Bowl it’s still nice to know I don’t have to watch a Tampon commercial anytime soon since Hulu is where I subscribe for all of my TV needs.